God’s Love for Me. We all crave peace and security. And it can truly be found in God’s love and authority. The craving. It’s human nature. Stress isn’t something we seek after, as a trophy to be hung on the wall, but it seems to find us pretty easily. Life slips through our fingers so quickly and before we realize what’s happened we are in overwhelm mode, struggling and grasping to hold on. My experience is the same as yours. Generally speaking, of course. If I do not live an intentional and authentic life of seeking after God than life will get carried away and I will feel stressed out. I’m no good to my husband, kids and this ministry if I’m constantly in overwhelm mode. One of the many factors in helping me stay focused on God and soak in His word is my quiet time with Him. It’s more than just reading the bible like one would read a book. I write out key verses that, in the moment, resonates in my heart. I choose one verse a day to really focus on. I also speak them out loud over and over allowing the words to hang in the air for a few moments like a sweet perfume. 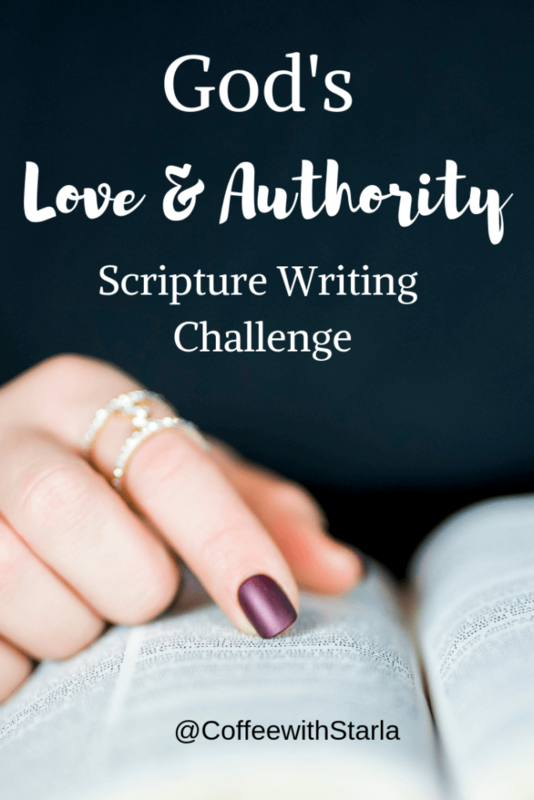 I was discussing a writing scripture challenge in my Facebook Group and a few of us loved the idea and accountability of a scripture writing challenge. 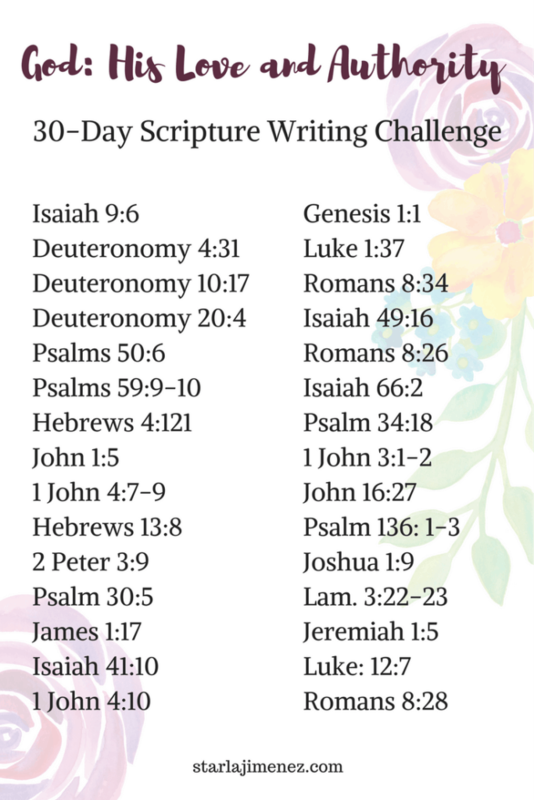 I created this 30 Day Scripture writing challenge and since it’s my first one I thought it appropriate to start it off with reading and writing scripture on God, His love and His authority. Let’s take a look at these 30 bible verses and find out about God’s love and authority. For the month of December, we will be writing scripture the names of Jesus! I’m looking forward to that one too! The purpose of hand writing Scripture is not to have another copy of the Bible. The purpose of writing out Scripture is to meet God in His Word. Writing the Scriptures out by hand offers us the unique opportunity to participate in an activity that forces us to slow down the process of reading and encourages a more reflective engagement with God’s Word. Writing Scripture helps us to memorize God’s Word. It deeply engraves God’s Word in our hearts, minds and souls. This is so important, because when a hard life trial comes we have filled our ammo box within ourselves with God’s Word. We can readily pull up scripture from our hearts and use them as a shield and weapon, in prayer ,against the enemy and to encourage ourselves during the valley’s of life. 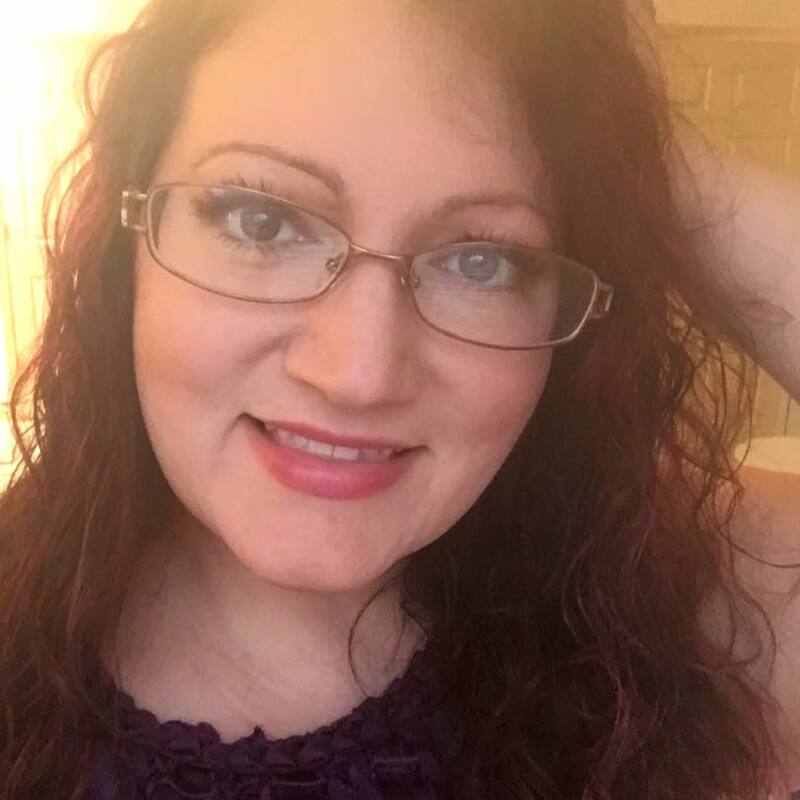 Will you join me in this scripture writing journey? Let’s link arms as sister’s in Christ to encourage one another and lift each other up in prayer. 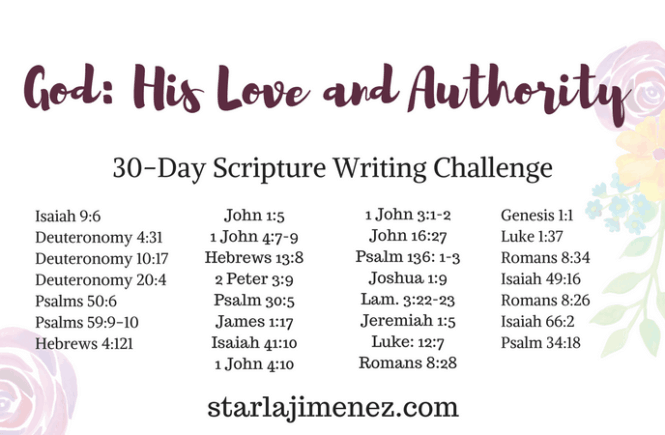 To get your free printable: God’s Love and Authority: 30-Day Scripture Writing Challenge click HERE and then come on over to our group where we will post pics and share our hearts on our writing challenge.